Fulham manager Kit Symons says leaving his role as Wales assistant was a disappointing decision, and one which was taken out of his hands. Symons relinquished his Wales duties in June, having been Chris Coleman's number two since January 2012. He initially combined the role with being Fulham boss, but was told he had to concentrate fully on his club commitments. "There was no other option unfortunately," said Symons. "It was a big disappointment to have to give up the assistant manager role with Wales but it's not really a decision I could take. "It's with a lot of sadness I leave the Wales set-up but I leave with my head held high. I absolutely loved the whole experience." Symons succeeded Felix Magath as Fulham manager on an interim basis in September 2014, taking over permanently a month later. Cottagers chairman Shahid Khan initially gave Wales permission to retain Symons's services following his appointment. But after Wales' significant Euro 2016 qualifying win against Belgium in June, former Fulham and Wales centre-back Symons turned his attention solely to the Craven Cottage side and was succeeded in the Welsh set-up by Paul Trollope. 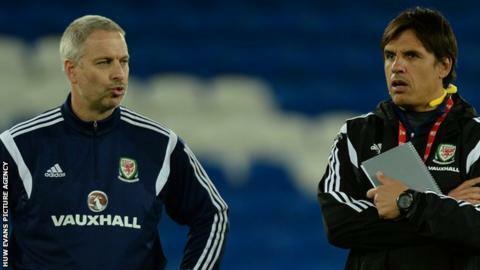 "To be manager of a Championship club and to come away [with Wales], it was just too much," Symons told BBC Wales Sport. "There was a lot of running around. It's completely understandable why they [Fulham] wanted me to fully concentrate on such a big job." After beating Belgium, Wales are top of Group B and have a strong chance of qualifying for the finals of a major tournament for the first time since 1958. "We've been through some pretty tough times and it was great to get through those and be successful like we have been in recent games, and I'm sure we will continue to be so," Symons added. "We've got fantastic staff in the Wales set-up. "The guys aren't under contract, they just get paid a flat match fee. They're doing it because it's something they love doing."